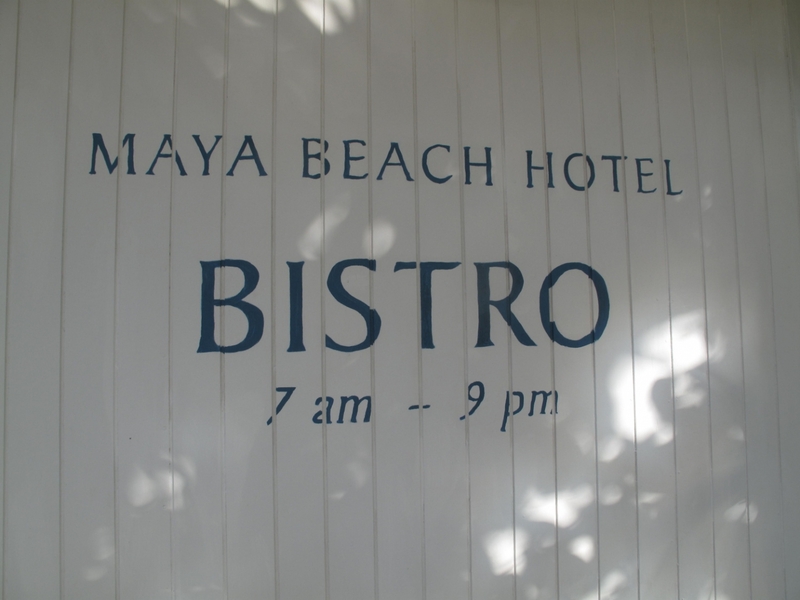 Last year the Belize Tourism Board awarded the Maya Beach Bistro, Belize’s “Restaurant of the Year” for the second time. 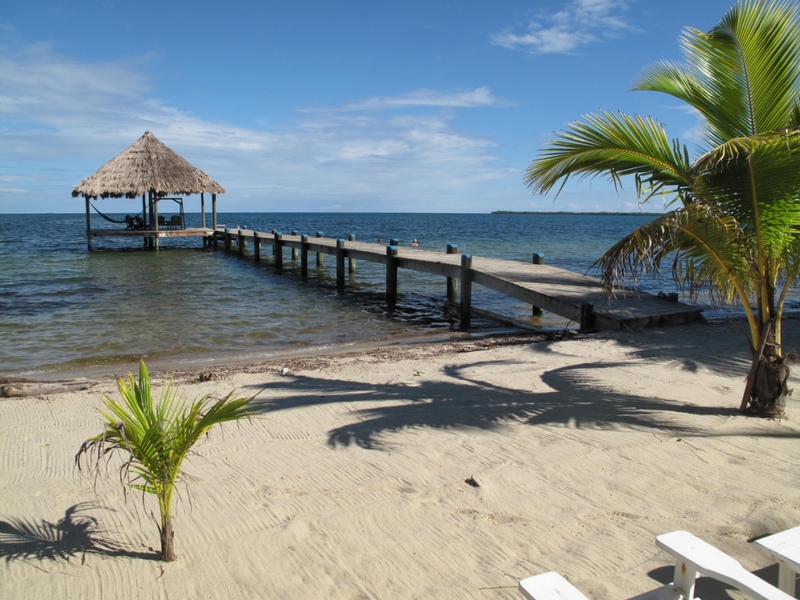 The 2012 awards were pretty much swept by businesses on the Placencia Peninsula and caused a good amount of controversy throughout Belize. Was it a fix? Well…you can be the judge of that. 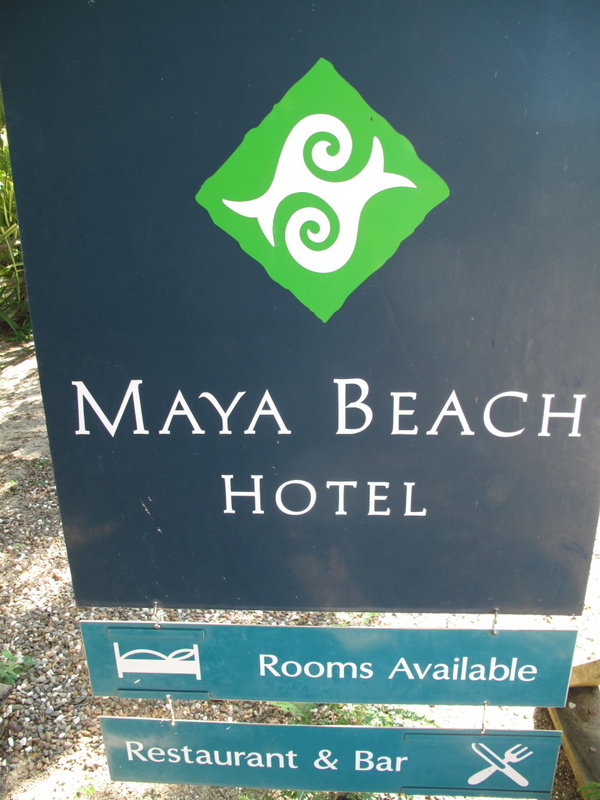 But after visiting the area twice in the last few months and eating as many dishes and desserts as I could at the Maya Beach Bistro, I am here to put one dispute to rest. 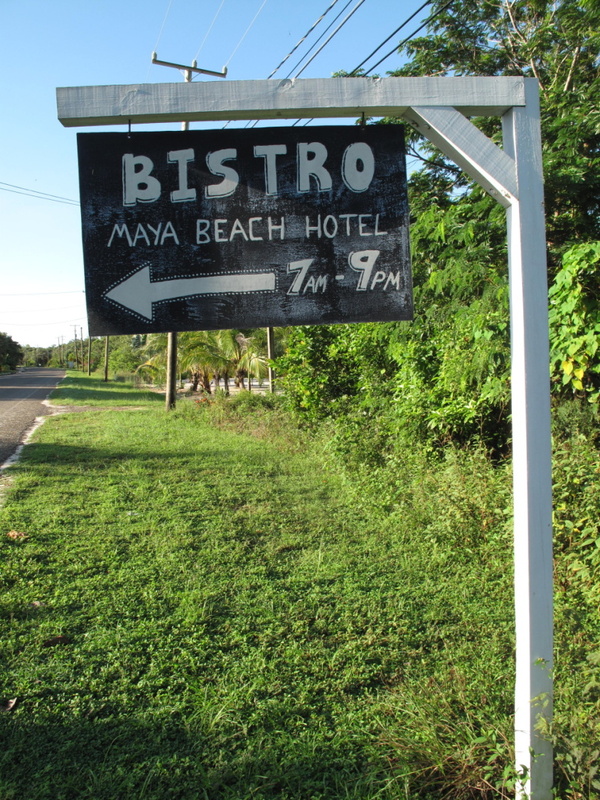 Maya Beach Bistro IS the best restaurant in Belize. Creative contemporary Caribbean? I’m not exactly sure what category the food would fall into and honestly, I don’t really care. I just know that this food is so incredibly beautiful looking and tasting. 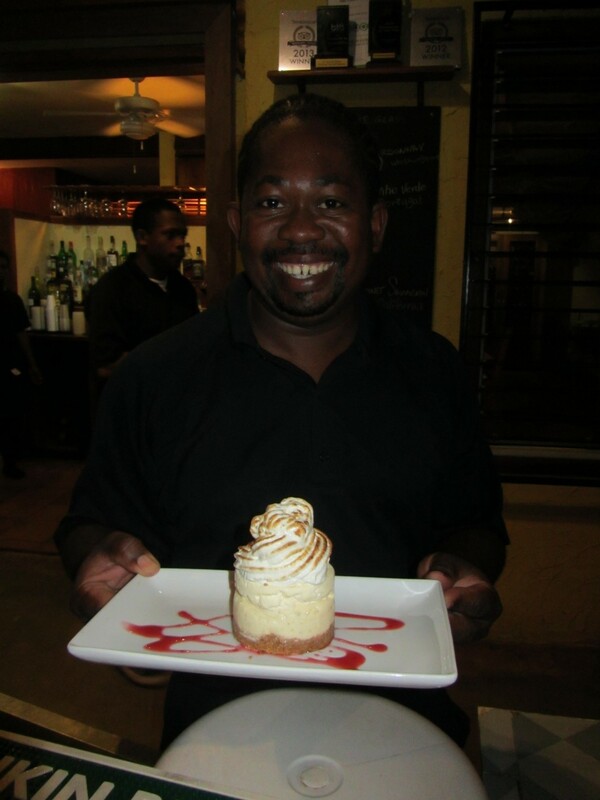 It is served in a elegant but homey beach bistro and the hosts are fantastic. In my uneducated estimation, the owners, Ellen and John are doing everything right. I will go to Maya Beach again (and hopefully again) ONLY to eat. The hot morning cinnamon bun dripping with creamy cheesy goodness is worth the trip alone. The sign on the road to indicate the restaurant is so remarkably low key. 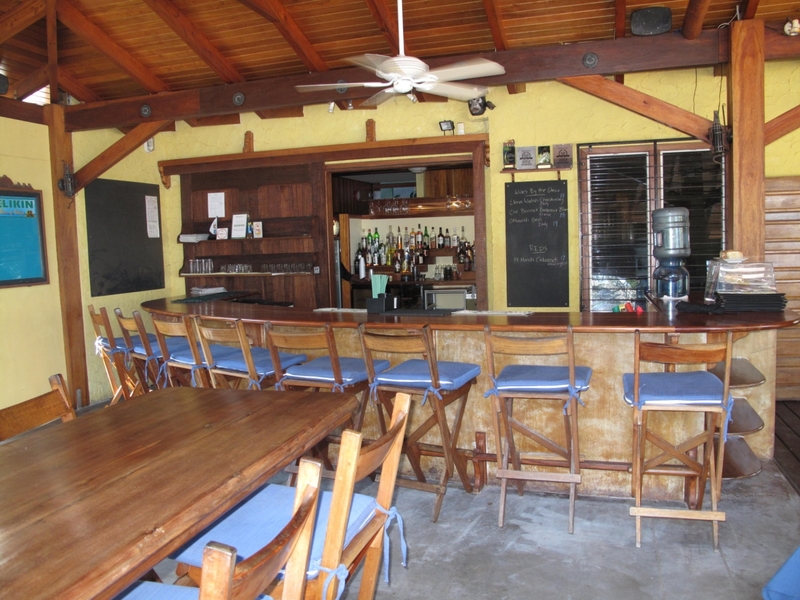 But when you walk in, there is a beautiful bar area (where I eat my meals) and a lovely pool. 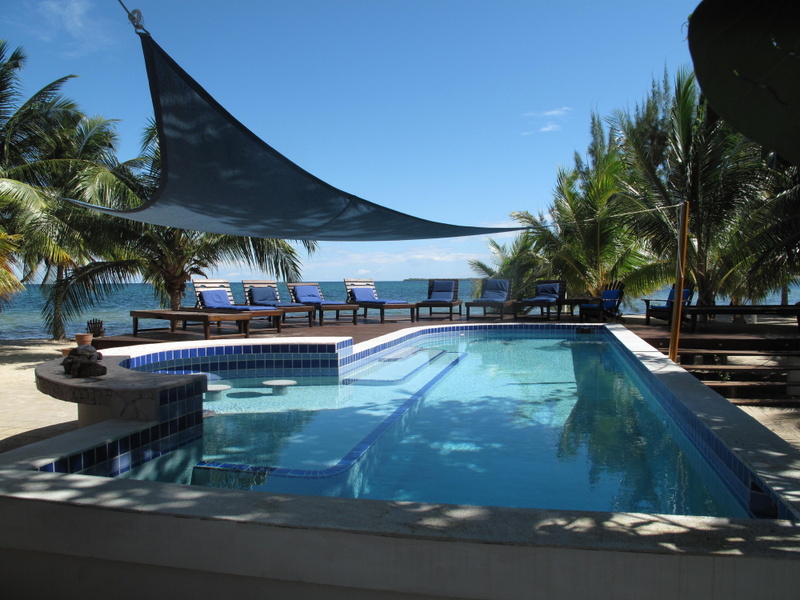 There are not many pools in this sleepy beach community so some area residents come to eat and lounge. 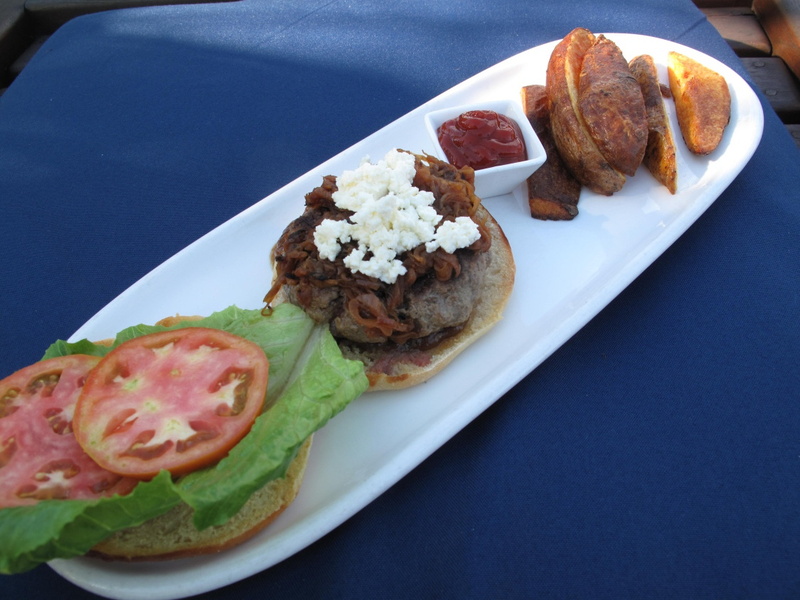 I actually ate my steak burger at the pool. You absolutely MUST check out their menus. So tasty with some sort of sweet/sour steak sauce and tons of carmelized onions…yum. 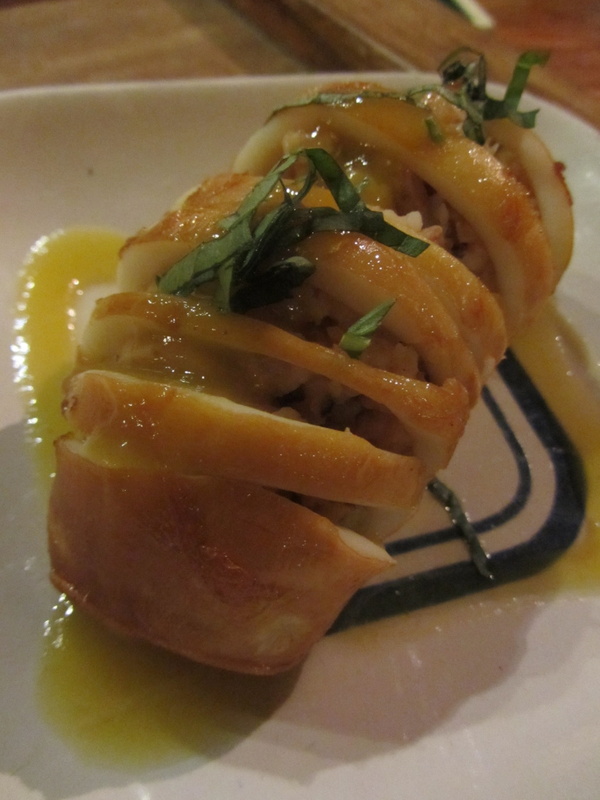 For dinner I focused on my two favorite courses, appetizers and dessert. 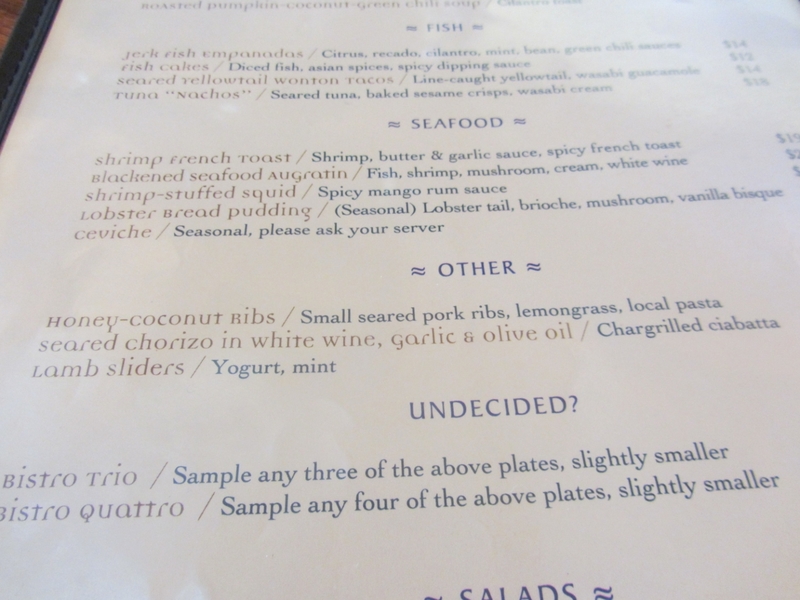 They do some beautiful small plates and for what I think is an EXTREMELY reasonable price, you can sample 3 or four. I asked Ellen, the owner, to help me choose her favorites. 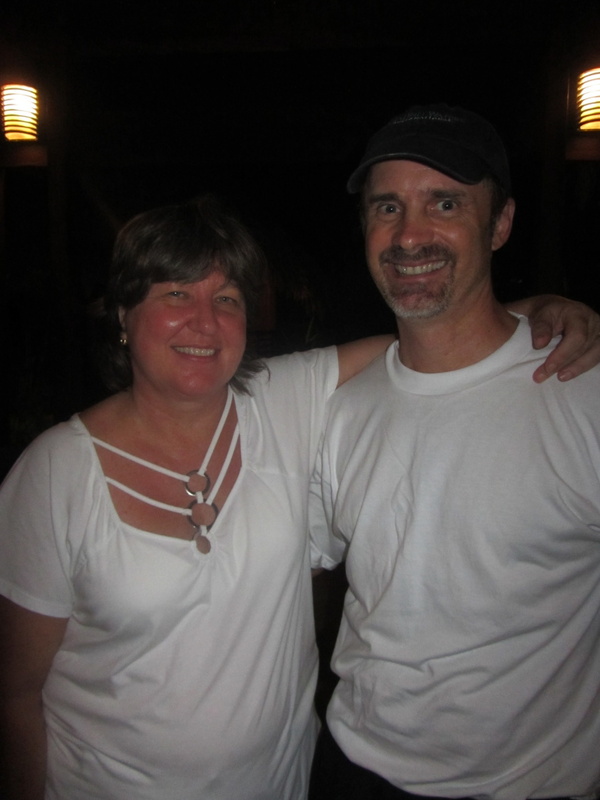 Here are Ellen, your hostess, and her husband John, the chef, after my meal. Ellen is also a pro when it comes to wine pairings. Just so you know. 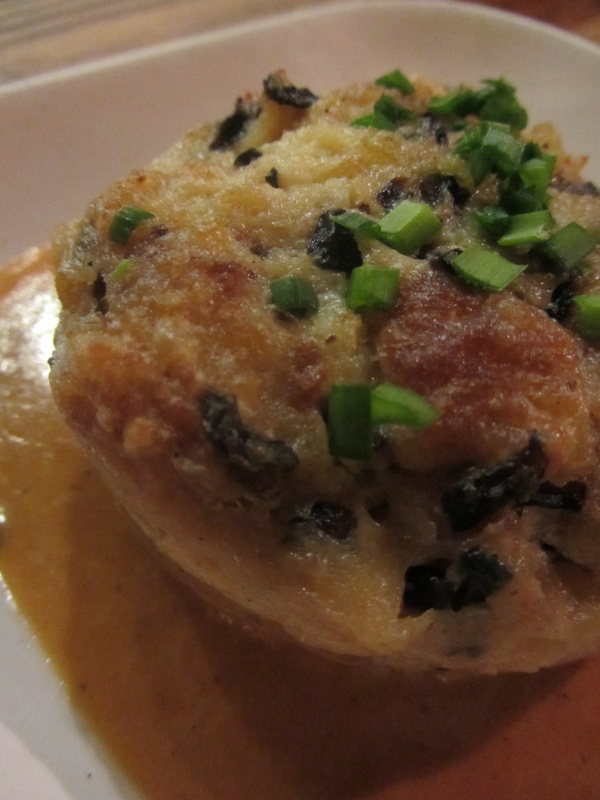 a delicate Leek Flan with Grilled Conch, bacon glaze, anise flavored spinach and sweet potato chips and then a Lobster brioche bread pudding that was…just…I mean seriously?…divine. Why am I writing this post with no food in the house? It’s torturous. Sweet and savoury, delicate and crunchy, creamy…I don’t know how they come up with these combinations. SO GOOD. And the three dishes were $39bzd. Love. Dessert is not even an option. 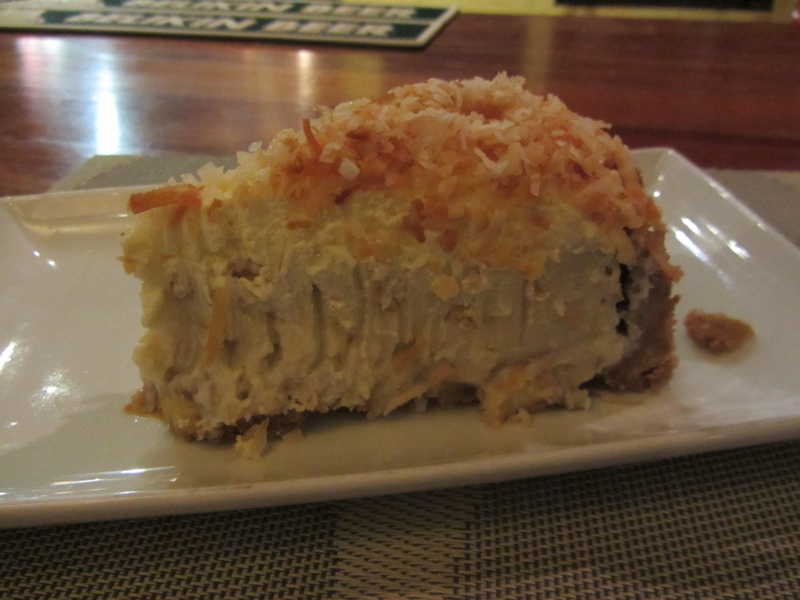 Last time I visited I had the best dessert of my life (no exaggeration), a wedge of Banana Coconut Cream Pie with cookie crust. And then? 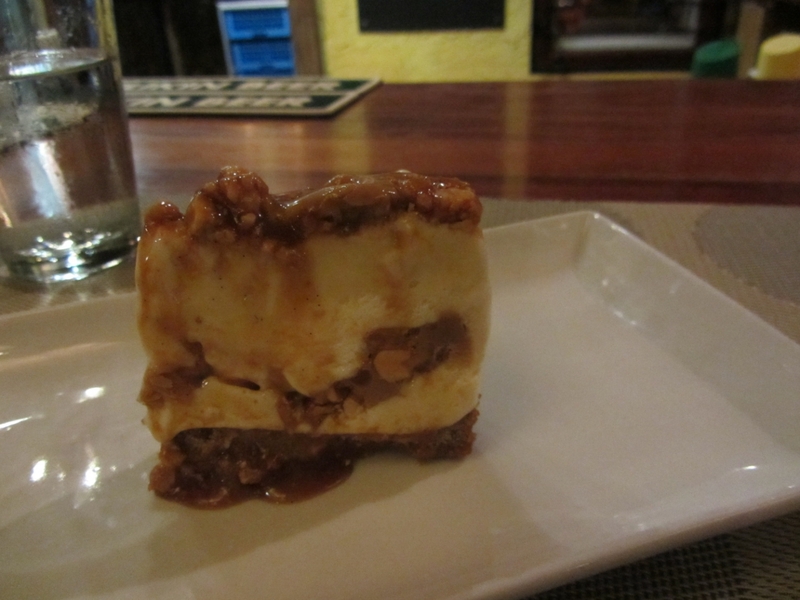 I had Peanut Brittle Ice Cream pie. The slices are huge. The desserts themselves could be a meal for a normal human being. 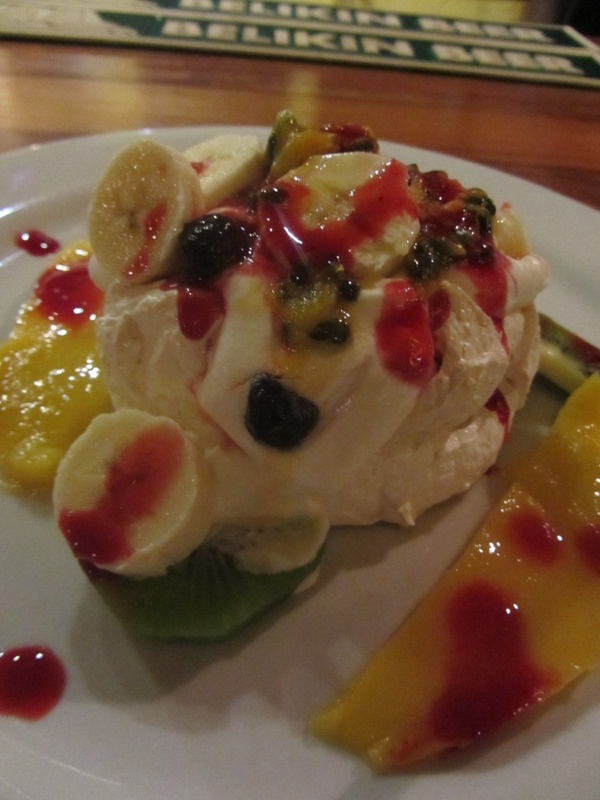 This time I went for the passion fruit pavlova pictured about. Heaven. Now let me show you where I rested between meals. 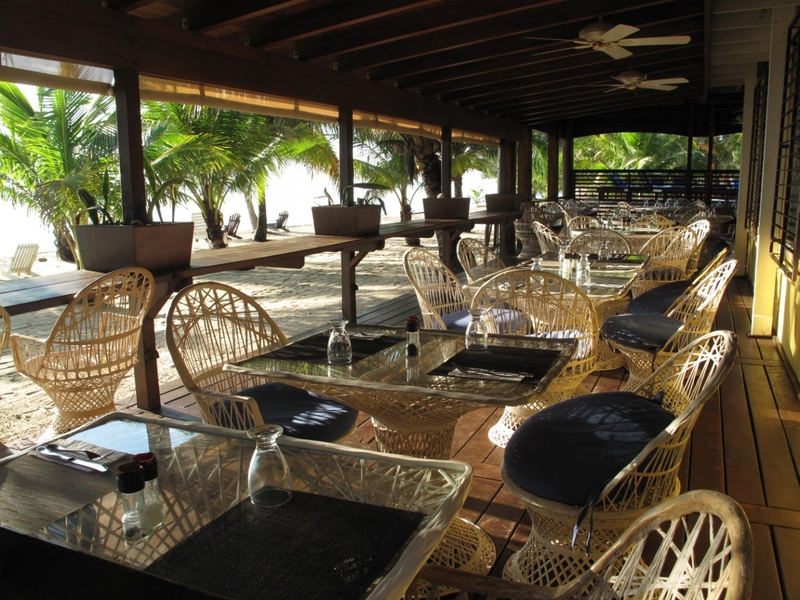 I stayed above the restaurant in the Coconut Room…super comfortable and very roomy. 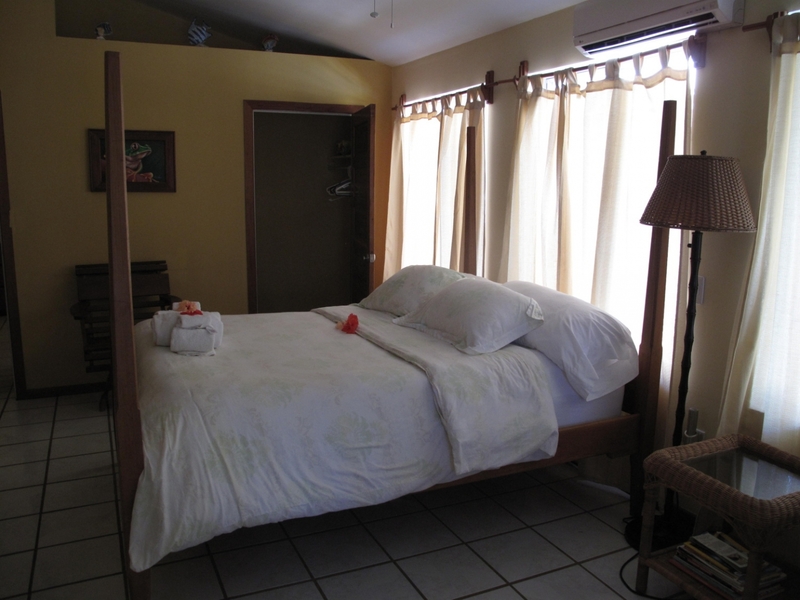 With a large sitting area and two bedrooms. 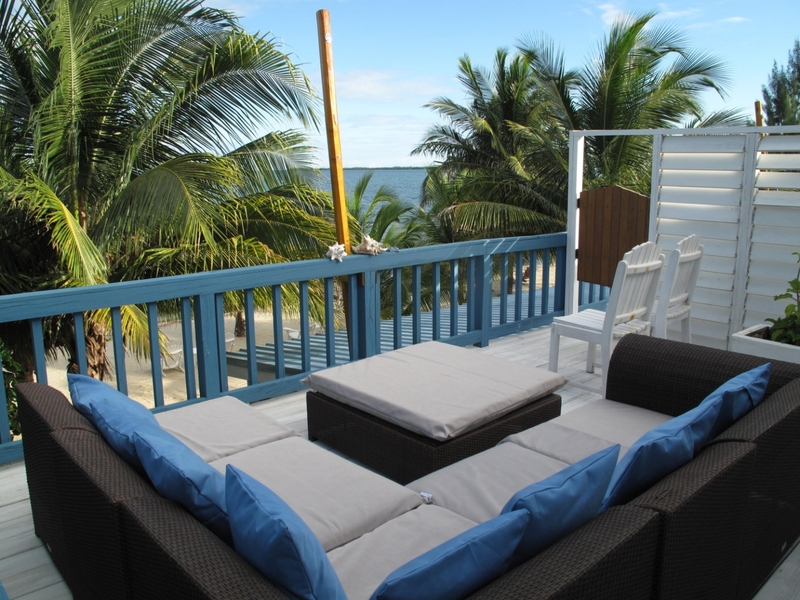 The hotel has lounge chairs on the pretty beach and a dock perfect for some hammock time. And the bar area. My seat is the second one from the right. The next morning, after a great night’s sleep on a very comfortable mattress, I came down for breakfast and was easily talked out of the 6:30am bus for the 7:30am local when I smelled the cinnamon buns baking. Maybe they’d be ready…maybe they wouldn’t. I went out to the bus with one from the previous day wrapped and ready for me. And then 2 minutes before my bus pulled up, John came running out and handed me a container…that I opened on the bus…and well? It was just one of the best things I’ve ever eaten. Yeasty and warm, the outer swirls just as good as the squishy center…I scraped every bit of the melted icing out of the container. The smell alone almost incited a small bus riot. 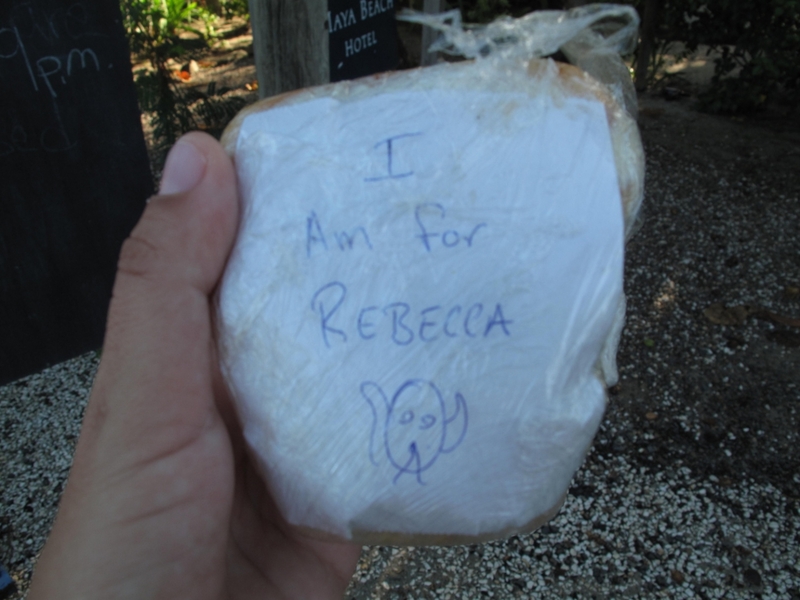 One which I appeased by giving my day old sticky bun to the money collector. Scoring me one free bus ride. Please don’t alert the bus company. the hotel is beyond comfortable and the food? Well, it’s to die for. There will be celebrating tonight at Maya Beach Bistro because I must award them the SanPedroScoop.com Sunglasses of Excellence. CONGRATULATIONS! 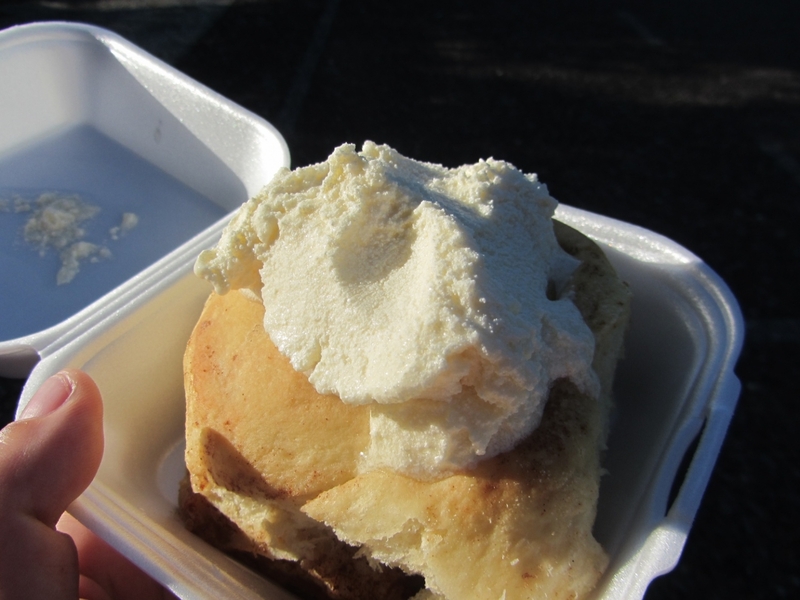 There is absolutely no way that I will ever travel to the Placencia Peninsula again without eating here…and I will make any vehicle I am in come to a screeching halt for one of these cinnamon buns. Oops, you did it again…made me drool all over my keyboard! We ate there only once, for lunch, and while it was good, it was not our favorite meal in Belize. 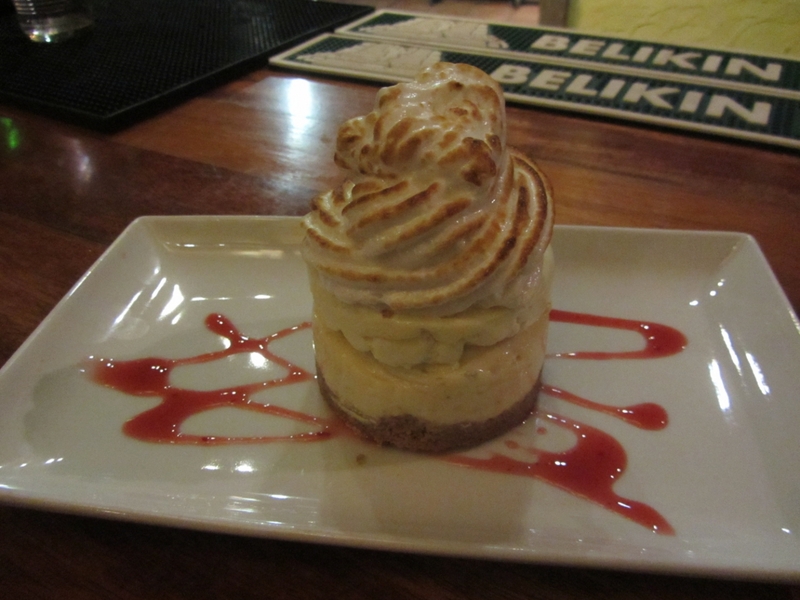 Looks like we need to give them another chance the next time we’re in Belize — for both dinner and breakfast — and desserts, of course, which we did not try. Everything looked and sounded amazing! It could not be more delicious. I really had one of the best meals of my life. Looks amazing and drool-worthy. We’re going to be staying here in Feb and are going to be sure to bring our appetites! Oh it’s amazing. 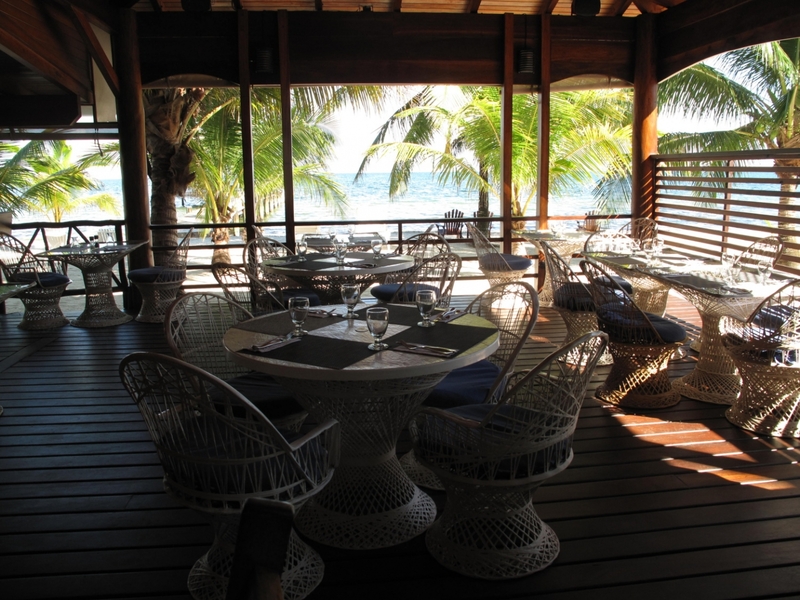 Seriously best restaurant in Belize and that is saying a BUNCH. Have a great time. Hope you are there for V Day weekend. Placencia has its big sidewalk/art festival. I’m definitely headed back!